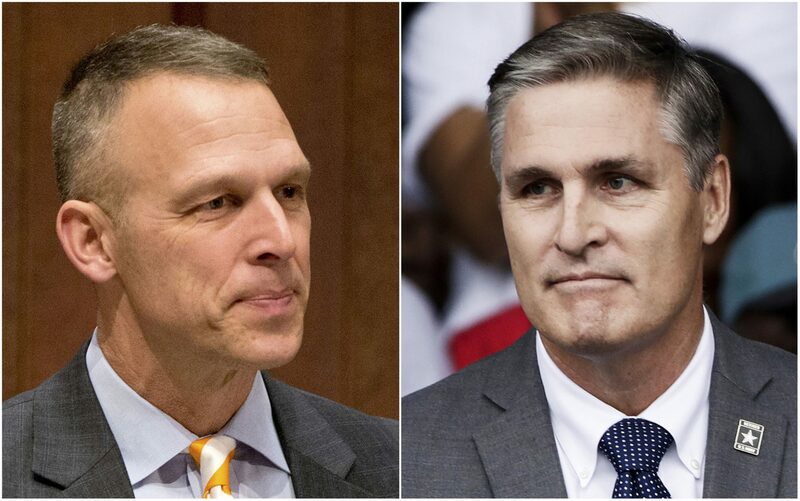 This combination of photos shows congressional candidates Rep. Scott Perry, R-Pa., left, and Democrat challenger George Scott. A court-ordered redrawing of Pennsylvania's House districts has forced several Republican congressmen including Perry into more competitive seats and helped establish Pennsylvania as a key state for Democrats aiming to recapture the House majority. We're breaking down the Thursday evening debate. Reporters Ed Mahon and Emily Previti are annotating key moments from a televised debate between Republican Congressman Scott Perry and Democratic challenger George Scott. WGAL’s Janelle Stelson and Mike Straub moderated the Thursday evening debate. To see the notes, click on the yellow areas. Perry and Scott are competing in the 10th Congressional district, which includes all of Dauphin County, plus parts of York and Cumberland counties. Mike Straub: All right. Let’s get right to it, gentleman. Thank you both for being here. Our first question goes to the winner of the draw. That was Congressman Perry. So, congressman, every American, regardless of location, income or age relies on our health care system in one way or another. The costs of care, insurance and medicine continue to rise, to the point of forcing some Americans into bankruptcy. What will you fight for to ensure all Americans have access to reliable and affordable health care? Scott Perry: What will I fight for? I will tell you one thing that I’m really privileged and proud to fight for and to clarify at this debate is this issue of pre-existing conditions. We all knew that we wanted to repeal Obamacare. And I want to repeal Obamacare because it is bad law. It is actually so bad that even Democrats are running away from it. They’re not trying to salvage it any more. They’re actually looking for single-payer and complete government-run healthcare. But at the time, we were repealing Obamacare, Paul Ryan put forth a bill, all right, to replace it, and if you recall when that happened, that bill failed on the first try. If you recall all that. And we kind of stumbled and stubbed our toe. One of the reasons it failed is because it didn’t adequately deal with pre-existing conditions. I know hundreds of people, including people in my own family, that have pre-existing conditions. We knew that insurance companies were denying people the care and the coverage that they should have just because of pre-existing conditions. And a bunch of us, myself included, said absolutely not. We will not, we will not vote for this bill, for myriad reasons, the most important one is not dealing with pre-existing conditions. And the bill that we passed, finally, that failed in the Senate dealt with pre-existing conditions completely and disallowed insurance companies to restrict people from care or coverage for pre-existing conditions. Mike Straub: Thank you, congressman. Mr. Scott, what will you fight for to ensure affordable health care? George Scott: Well, I’ll fight for the people of the 10th Congressional district, all of whom, as well as everyone in our nation, deserves affordable and accessible health care. And I’ll do that first by repairing and stabilizing the Affordable Care Act. It was certainly not a perfect piece of legislation. And yet it extended health care coverage to millions of Americans who had no coverage before. To say that it’s a perfect system — or not a perfect system rather — doesn’t mean that it’s not good. And so we need to take that as the foundation and build going forward. We need to increase access to preventative care, which is, prevents the long-term bills. We need to make sure that there is coverage for those with pre-existing conditions. My opponent has said that he is in favor of sustaining that. And yet there were two separate occasions. First in 2013, when he voted for House Resolution 45 and then again in 2015 when he voted for House Resolution 596 that would have repealed the Affordable Care Act in its entirety to include coverage for those with pre-existing conditions. I want to make sure that we have coverage for those with pre-existing conditions but that we go further and try to cover these escalating costs so that all Americans will be able to benefit, and not be worried about whether or not being able to provide for themselves or their loved ones. Mike Straub: Congressman, he brought you up by name there, did you want to respond? Scott Perry: Sure, I think I do. Absolutely, we ran on, many of us, on repealing Obamacare because it has failed. And like I said, even Democrats are running away from it. The costs are spiraling. Most counties in the country, across the country, only have two insurers under the exchanges, and the cost — deductibles have quadrupled. Right ? And you think when the deductible goes higher your premium goes lower. But not with the ACA, not with Obamacare. So even though I did vote to repeal there was always a place in mind to replace that with a better system, which is what I voted on and voted for. Janelle Stelson: Are you saying that Mr. Scott’s ad saying you are against that is misleading then? Scott Perry: I say that that ad is a lie. I think that Mr. Scott knows better and I know it’s a lie, because there was always the intention to deal with pre-existing conditions, every single time, and that was made clear at the time we passed that bill. Janelle Stelson: Mr. Scott, anything to say about that? George Scott: And yet he voted twice for legislation that completely repealed the care in the ACA for those with pre-existing conditions, with no legislation in place to replace it. Scott Perry: The premise is, is flawed in that the only way to deal with pre-existing conditions is through Obamacare. That’s simply false. And the plan now with this health care for all at 33 trillion dollars, I mean we’re going to double everybody’s payroll tax, we’re going to double employer taxes, I mean there’s no plan to pay for that. That’s the alternative solution to the ACA from the other side – untenable. Janelle Stelson: OK. We’re going to move along. 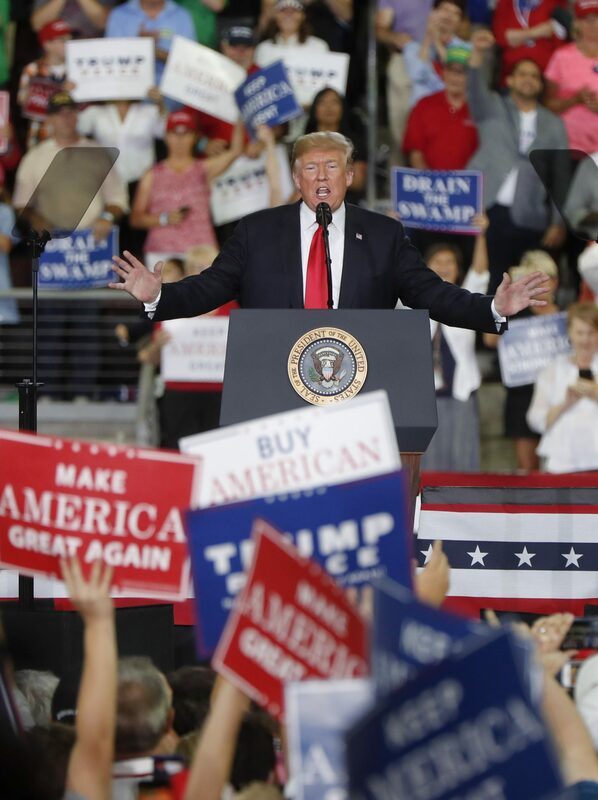 President Donald Trump speaks at a rally endorsing the Republican ticket in Pennsylvania on Wednesday, Oct. 10, 2018 in Erie, Pa.
Janelle Stelson: All right. Next question. We go first to Mr. Scott. A lot of voters are expected to go to the polls as a referendum this time around on President Trump. Do you think that’s going to help or hurt you? And is Mr. Trump somebody you feel you can work with to make the Susquehanna Valley in Pennsylvania a better place to live? Mr Scott? George Scott: Well, I’m running to help improve the lives of voters in southcentral Pennsylvania. As far as I’m concerned this is not a referendum on President Trump. This is about bringing better leadership to Washington, D.C. — leadership that will reflect the voices and values of people here in southcentral Pennsylvania and that will make sure that that we’re looking out for interests of people at home rather than a particular group like, say, the Freedom Caucus in Washington, D.C. This should be about the people here at home. As far as the president, if there are policies that are serving the interests of the United States, for example, bringing home the remains of Korean War veterans from Korea — I’m fully supportive of that. Even the, the newly renegotiated replacement trade act for NAFTA, the United-States-Mexico-Canada act, I think there’s some benefit to that. Most of the farmers that I’ve talked to who are particularly affected by that think it’s a step in the right direction. So I’m not completely, I’m not an idealogue. I’m a practical person who wants to work on bipartisan solutions — solutions that will benefit the people right here in this district. And at the end of the day I think that’s what voters want. They want representatives that will go down there and that will work hard on their behalf and make sure that their voice is heard and that their interests are represented. And that’s exactly why I’m running. Janelle Stelson: OK. Congressman Perry. Scott Perry: Well, I think and I hope it will be a referendum on is your life improved in the last two years. And if we look at like I said the market up 7,000 points, employment up, opportunity up, wages rising, hostages coming home, getting out of bad trade deals. This is all good news. And people in this district and hopefully the new district will learn that I am a good representative, and I’ve listened to all viewpoints. I don’t go out and protest things and then come back to my office and say, ‘Well come in and talk to me.’ And you don’t know whether I’ll call the balls and strikes correctly. I take all people that come in and meet with them and listen to their concerns and make the best choices I can with the things that are in front of me. And I think that that’s what your representative’s supposed to do. Not go down there and be told by leadership what to do. We come to participate, not to take orders. We joined a different organization to take orders. But this isn’t it. And I’ve told my leadership that. I support the policies and the things that are important in this district and I always have and that’s what I hope that the voters will be thinking about when they go to the polls. Janelle Stelson: Is this a president you enjoy working with? Scott Perry: I like his policies and I think he’s heading in the right direction. I think he’s done things that haven’t been done in a very long time. I do think he’s a disrupter. It makes it uncomfortable for some folks, but I tend to look at not the drama. I try and stay out of the drama and stick to the policies. And I think the policies are working. And you’re seeing the fruits of that all across the country. Janelle Stelson: We want to talk about the environment. We’ve gotten a lot of e-mail from people who’d like to ask this question. The United Nations just releasing a major report. Ninety-one scientists from 40 countries warning that climate change is now happening so quickly that in little more than a decade Earth could suffer a catastrophic breakdown. First do you believe in climate change? And if so how would you work to turn the tide? George Scott: I do believe in climate change. I think the scientific evidence in support of it is overwhelming and to say that the climate changes naturally — of course it does. But the rate of change is the issue and that’s what the science is pointing to. The rate of change is far beyond anything we’ve ever seen. And so we need to work now and not keep kicking this can down the road. This is an issue that could potentially have a drastic effect on our children and grandchildren. So we have a moral obligation to make sure that we hand off to them an Earth that is, that has a climate that’s balanced. What I would specifically support is moving us as a nation through market driven forces towards renewable energy sources. One of the best ways to do that is a policy referred to as the climate fee and dividend policy. Now my opponent is going to tell you that it’s a tax. It’s not a tax. It’s revenue neutral. It takes a fee that’s put on carbon based fuels at the point of production or entry into the country and then that fee is distributed as a dividend to consumers. So for consumers there is in fact no fee, no additional costs. But what it does is as the cost of carbon fuels goes up governments and businesses gradually move away from fossil-based fuels and move towards renewable sources of energy. In the long run, that type of program will not only reduce carbon emissions by 33 percent in a decade. It will also create 2.1 million new jobs. Those are the kind of jobs that we want to have right here in southcentral Pennsylvania. Janelle Stelson: Thank you. Representative Perry. Scott Perry: I think obviously man has a part to play in that. We know that CO2 is in the atmosphere and it affects it. But the question is, is how and then what can we do about it, what should we do about it, and what do we do with all the other nations that pollute much more, much more than the United States. As a matter of fact, last year the United States had the greatest reduction in CO2 emissions. So we are doing our part. But the, the program that my opponent is espousing from the U.N. — a couple of things to know about. It’s already been tried in Australia. Some metrics that go with that. CO2 actually went up, the deficit went up, the costs went up and unemployment went up. If we’re going to do that we should look to them and say, how did this work for you? And do we want to do this in America? And by the way the very U.N. plan that that my opponent has talked about also said that … it would raise fuel prices, gasoline for your car anywhere from one dollars to 50 dollars a gallon on top of what you’re already paying. I think you have to proceed very carefully here before we, before we do that to our people in central Pennsylvania and across the United States. Janelle Stelson: You talked about some of the progress that has been made, that was made under the emissions controls that the Obama administration put into place. Scott Perry: And other, and other administrations. Janelle Stelson: Yes, but he worked toward that and the current president has worked to roll much of that back, cutting the EPA in some, in many ways actually. And I believe you’ve voted for those things. Scott Perry: In some cases, I have. What we don’t want to do is put ourselves in a position where we’re paying countries like India and China to clean up their mess and we cut our emissions and they could continue to pollute for another 20 years and then the United States economy has to pay for it. And that’s what we’re working towards. We want to clean up our mess, but we want them to clean up their mess and pay for their clean up as well. We’ll help them but we can’t be responsible for it and pay for it. Janelle Stelson: How specifically do you want to clean up the mess here? Scott Perry: Well, here? Well continue to move forward with things like, the economy does a great job. You look at what natural gas has done to some of those CO2 emissions from our coal fired plants. That was going to happen as a natural progression of the economics of natural gas and our availability to get it. And of course you know Pennsylvania, rich in coal but also rich in natural gas and we’re sitting right on that. And so we moved many of our plants from coal to natural gas just because of the economics and just by doing that, not with the requirement of government, we’ve really helped clean up our atmosphere. We just need to continue to do these things in a market based fashion. And they actually do work. Janelle Stelson: I don’t want to take too much time on this. But no Republican no Democrat, if we don’t have an Earth none of us have a place to live. George Scott: Exactly. And while natural gas is better than coal in terms of not contributing to climate change, the reality is it still does contribute to climate change. And as far as gas prices going up, gas prices have gone up more in the past year than at any time that they did during the four previous years. So we need to focus on the fact that we need to take action on this and the U.S. must continue to be a leader in climate change as it was in the past and not abandon its role. Mike Straub: The Trump administration is enforcing stern tariffs designed to level the playing field for our industries in international markets. But farmers here in Pennsylvania say the tariffs are hurting their bottom lines. What is your message to those farmers? And what kind of future for tariffs will you fight for in Washington? Scott Perry: Well, the message to the farmers is: I understand. And, of course, I grew up working picking fruit and working on a farm. So not only from a from the policy perspective, but from the doing business end of the perspective. And, of course, I go to church with farmers, and so on and so forth. So, I’m very attuned to what they’re dealing with, whether it’s milk or whether it’s grain or what have you, and I know that they’re suffering. One of the reasons they’re suffering is for trade agreements like the one we had NAFTA with Canada, for instance, where we couldn’t sell our dairy products from Pennsylvania into Canada but that they could sell theirs into ours. This is painful, and I don’t like tariffs because they hurt the consumer. The consumer ends up paying more. But the administration, our government, has few options. Right? What are we going to do? We’re going to do a tariff we’re going to do a sanction or we’re going to do military action. Military action certainly isn’t the right answer. If you’re going to sanction somebody, what’s the punishment? We’ve made these agreements. So the president is trying to force better agreements that have been made over a long time a long period of time and update them. And the only way to get some of these folks to come to the table is with the threat of tariffs. And in the meantime, the administration has also rolled out money and funds to make up the difference for the farmers, in the meantime, while the deals are coming together. And you can see that they are coming together. NAFTA now changed with the agreement with Canada and Mexico. The EU is trying to get in line because they see what’s happening. South Korea’s already there. Japan is right behind them. Australia. The big one is China. And this is to isolate China so that they quit stealing our intellectual property and taking advantage of our economy. Mike Straub: Mr. Scott? Future of tariffs? George Scott: Well, as someone who grew up on a farm and has a daughter who is studying agriculture in college and has a congregation filled with farmers, I’m deeply concerned about this issue and I’ve met and talked with farmers on numerous occasions. The tariffs have, quite frankly, hurt our farmers in a way that was unnecessary. To imply that the only ways we have to deal with trade with bad actors in the trade arena is either tariffs or or or weapons or to do some type of sanctions completely overlooks the fact that diplomacy is one of the most effective things that our nation has. And so, we should use diplomacy and, in particular, we should use the World Trade Organization. The United States has succeeded in over 91 percent of the claims that we put before the World Trade Organization. That’s the way to deal with this. And particularly, we need to go after China. But we should not be targeting our allies like Canada or the European Union with tariffs that hurt the farmers back here terribly. Soybean prices have practically collapsed and prices for dairy and other industries are very low and the farmers are paying the price for that day to day. Scott Perry: I don’t, you know, our allies they’re … I’m sure they are our allies ,but they’re happy to take advantage of our markets when they can, and they have. And they continue and will continue to do that. And diplomacy, unfortunately, hasn’t gotten us any better — and relying on the World Trade Organization, which allows China to continually cheat. Regardless of how many cases we win, they continually cheat. And to allow that and count on the World Trade Organization to deal with America’s problems. We’re representatives of the United States of America, not of the World Trade Organization, and that’s what we need to be focusing on. Mike Straub: And I know the farmers received some help. So is the message, really: Gotta tough this one out, … it’s going to be better in the long run? Scott Perry: That’s exactly right. George Scott: That’s a great message if you’re not a farmer. Farmers need help and they need it now. Mike Straub: Thank you, gentlemen. Janelle Stelson: The mission of our partners, the American Association of University Women, is to advocate for women. So let’s talk about the wage gap. On average women are paid 80 cents for every dollar a man gets for doing the same job. Will you work toward equal pay for equal work? And if so how? George Scott: Yes. I will absolutely work towards equal pay for equal work for women. Women are the majority in our society and hopefully they’re going to soon be equal numbers and even perhaps a majority within our Congress. They bring a unique perspective and a unique ethic with them. And so as as the father of a daughter, I want to make sure that she has an opportunity to go out into the workplace and to receive equal pay for equal work. The wages that they have, they’ve got to be addressed through a variety of ways. One of the things that I’m very interested in doing is going to Congress and joining the Men for Women Caucus which is just being established by Congressman Don Beyer. It’s a group that will be designed to speak up specifically, male elected leaders speaking up specifically for women on their behalf. I think we need to look across the board at ways that we can improve the situation for women and in particular increasing wages is one of those. Janelle Stelson: Thank you. Congressman Perry. Scott Perry: Well, absolutely, and I will tell you, my mama taught me how to treat a lady. I don’t have join a caucus to do that. I have two little girls. Of course, my mom was the president of our company and my wife is a career woman. This is actually fairly simple. One standard for everybody. You do the work you get paid the wage. Now I think what we can do, I think, in cases of the past maybe we discouraged ladies from getting into certain different vocations and there’s no reason that has to be done. I mean women are in combat now. Women are doing everything that generally speaking men are doing and they should be if they’re capable of doing it. And so it’s important that we, that we acknowledge that in our society and say that these things can be done by everybody and earn a commensurate wage. Janelle Stelson: You’re a three-term congressman. Have you worked on this issue yet? Scott Perry: Yeah, sure, in, with like the SKILLS Act, to make sure that everybody was looking towards the thing where they could make the living that they want, aspire to that wage, that salary level based on their work. Absolutely. We’ve passed legislation to deal specifically that. Janelle Stelson: OK. Thank you. Mike Straub: Alright, this question begins with Congressman Perry. The images of family separations shocked a lot of people. We learned just this week the Trump administration says 66 children remain in U.S. custody after they were separated from their parents who entered the country illegally this summer. Give us your top two priorities for immediate immigration reform. Scott Perry: Well, first of all, every single one of us, whether you’re a parent or not, you see those little children that are abandoned. They are in a strange place and you can only imagine how horrific that is and in your heart is broken from them, however they got there. I think we have to acknowledge too that many of them are separated before they got to the border and they’re with someone that is trafficking them. And so, from my standpoint, especially in protecting the children that come to the border, is making sure that they’re not trafficked. If they’re coming to the border, then we have an obligation. If they’re with their parents, then we have to deal with that appropriately. And the best thing to do would be to revise our immigration laws so that everybody, like my grandmother and my great-grandmother, came legally. So that it doesn’t encourage people to come illegally and discourage legal immigration because it’s too tough in many cases. And I’ve said that many times. Our immigration system is broken and needs to be revamped. I was privileged to work on the two bills. Goodlatte one and Goodlatte two, as they were characterized over the summer, on immigration reform, which was going to reform a whole host of these things and make sure that we had appropriate levels and it was a merit-based immigration system. So, it dealt with what our country needs as well as the other countries that have individuals that want to come to our country while doing it while doing it safely. Unfortunately, we only got 195 votes and we needed 218 to pass. I urged our leadership to go back. We could give a little on each side and get something passed. I’m hoping we take it back up when we come back in. Mike Straub: So is that an important policy to push a merit-based system as an important step in the right direction? Scott Perry: Yeah, the world is changing. And we’ve got to know who’s coming in here and for what purpose. 40 percent of people here illegally are actually visa overstays who came legally and then just stayed. So we have to fix those problems. Mike Straub: Thank you, Congressman. Mr. Scott. Top two priorities for immigration reform. George Scott: Right. So, we have to have comprehensive immigration reform. What we have to do it in a bipartisan manner. To refer to the Goodlatte legislation as being a piece of legislation that was a good solution reflects the fact that this is not a bipartisan approach that you see from my opponent. There was not a single Democrat that voted for that bill and in fact 41 Republicans voted against the bill because they didn’t feel it was the right solution. So, we need to develop bipartisan solutions to immigration. It is a tough issue and bipartisan solutions are lasting solutions. Above and beyond the general improving comprehensive immigration reform, we need to also look at securing our borders. But doing it in a responsible and compassionate way, not tearing children away from their families as has been done on the current administration. And finally, I would point out the figure Mr. Perry cites of … I think it was 41 percent, he said, of children are being trafficked illegally. The reality is according to government data. Less than 1 percent of the children that cross the border are being crossed by traffickers. Most of them are coming with someone in their family. Scott Perry: Just to be clear I didn’t I didn’t use a 40 percent term regarding trafficking of children. The trafficking of any child is horrific. Janelle Stelson: We cannot talk about immigration without talking about the wall. President Trump promises to build on the Mexican border. First, a quick yes or no from both candidates: Do you support building a wall? Janelle Stelson: OK. Now let’s dive a little deeper. We’ll begin with Mr. Scott. As taxpayers, do you think we should be concerned about construction costs? They’re still unknown, but the Government Accountability Office now says it will be billions more than the president has stated. You’re not in favor. If you’re elected, how are you going to work with a president who has made this a campaign promise? George Scott: Well, I understand the president has made a campaign promise. But the reality is is that the costs are going to be huge. A minimum of $25 billion is the price quoted by the president. Other government estimates say it could go up to $70 [billion or] 75 billion. Those are funds that we can better use for priorities right here at like improving our infrastructure which would create jobs and help people right here in south central Pennsylvania. Building a wall will certainly help some contractors who are lucky enough to get those lucrative contracts. But static structures like a wall are not the most effective way to prevent illegal immigration. We have all kinds of different technological means which can and should be employed along the border. And we need to continue to support those who are working on border security. They have got an incredibly difficult mission. And I want to make sure they are supported and funded in their mission and have the training and resources that they need. Janelle Stelson: Congressman Perry, you want the wall. How are we going to pay for it? Scott Perry: Cost is always important. We would hope to to have the help of some of our neighboring countries to pay for that. And I think that’s a deal that can be made between the two countries. Janelle Stelson: They have clearly said they are not paying for it, Mr. Trump. Scott Perry: Yes I know that. I know they. But we are the largest economy in the world and they want to trade with us. And there’s an impetus there for them to work together with us and I think that they should, and I think that we can. We can’t discount the cost of illegal immigration whether it’s prisons, whether it’s our health care system, education system. Those things are big costs that are happening right now every single day and all of our communities. And we can’t discount the cost of human trafficking. And we can’t discount the 100 Fentanyl deaths coming across our border every single day. It’s up 750 percent this year, Fentanyl coming into this country. They bring it across the border today and tomorrow it’s in your community via U.S. mail. That’s a cost, too, that we can’t we can’t disregard. Janelle Stelson: And you think that a wall will stop that? Scott Perry: I think it will help.